The sun shone brightly on Saxton Oval and fearless Ireland on a day that will be remembered for years to come in the faraway pubs of Dublin and Belfast. Bowling with purpose, fielding with precision and batting with panache, Ireland chased down 305 against West Indies to infuse the first round of the ICC Cricket World Cup 2015 with life on Monday (February 16). For years now, Ireland had punched above its weight, pulling off stunning upsets more than once, but, on this occasion, right from the first ball of the game, till the moment when the winning runs were scored, there wasn’t one Ireland player with any self doubt. The manner in which Ireland set the pace against a team that could so easily have bossed it over on another day, showed just how good it really is. 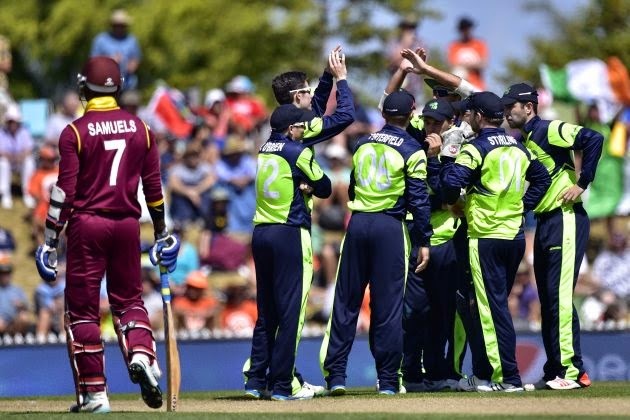 And this was no fluke, in that the conditions were not stacked especially in Ireland’s favour, and West Indies did not take its opponents lightly. To start with, Ireland made the most of winning the toss, John Mooney and Max Sorensen doing just enough with the ball to keep Chris Gayle and Dwayne Smith quiet. Building pressure seldom fails to deliver results, and Smith was the first to succumb, holing out to long off against Kevin O’Brien. Darren Bravo was sent on his way, courtesy a direct hit from point, before he had even faced a ball, and the wobble was well and truly on at 31 for 2. For a time, Gayle defied, but scoring at a strike rate of just over 55 brought about impatience and the left-arm spin of George Dockrell proved too much temptation to resist. The heave over cow corner failed to boom off the bat and Kevin O’Brien settled under a comfortable catch. Two balls later, Marlon Samuels was pinned to the crease by Dockrell and even a review could not save him from being declared lbw. Denesh Ramdin suffered a similar fate in Dockrell’s next over, and Ireland was swarming all over West Indies with the scoreboard reading 87 for 5. If Ireland sensed it was on the verge of something special, it was dragged back down to earth by a stirring rearguard action from Darren Sammy and Lendl Simmons. With overs in hand, Sammy and Simmons built a partnership from scratch, taking their time to absorb the conditions and line up the bowling. Slowly gaining momentum till they had done enough to push the score past 200, both Sammy and Simmons cut loose.Sammy brought up his half-century off only 45 balls, and Simmons matched his partner, reaching the milestone off 62 balls with a straight six off Kevin O’Brien. After the pair had taken West Indies past the 200-run mark, the big shots became more and more frequent, and convincing. If Sammy was brutally effective in his hitting, Simmons was utterly easy on the eye when he drove through cover, oozing flair. 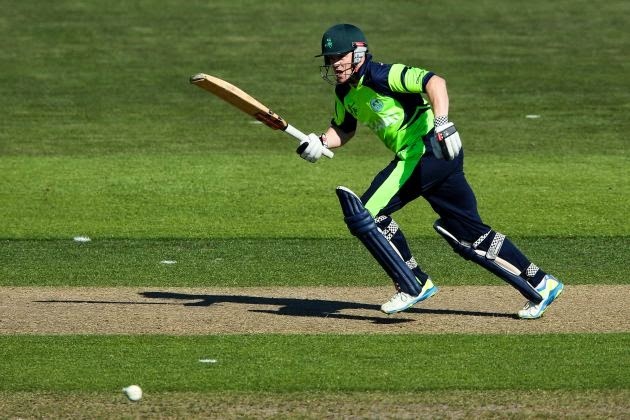 The 43rd over, bowled by Kevin O’Brien, was taken for 22, and Ireland would have sensed the tide turning. When Sammy pulled Mooney for a flat six to get to 89, he had posted his highest One-Day International score, and looked set for a well-deserved century. But, trying to clear cow corner, Sammy found Dockrell, ending a 154-run stand that equalled the West Indian record for the sixth wicket. Simmons showed his full range of shots, from the rasping cut to the meaty pull, and did not even break stride when he neared three figures, clattering a full toss to the midwicket fence in the final over to bring up the landmark. Simmons’s century had come off only 83 balls, with his second fifty taking just 23 balls. If Ireland was deflated at having to chase 305 when even 200 looked far away at the halfway mark of the first innings, it did not show in the least. William Porterfield and Paul Stirling raced out of the blocks, using the pace of the West Indian bowlers to maximum effect. Stirling did the bulk of the scoring, and when Porterfield (23) was dismissed with 71 on the board, there was no change in tempo.